It's always fun getting together with fellow crafters for a day of laughter and creativity! Yesterday I got together with my friend Sue, while we chat and laugh more than we create, I always have a wonderful time! We usually work on projects we have due, or sketches, and this visit was no different, Sue had out the recent 2Sketches4You sketch for us to work with. She also challenged me to use some images that are normally not my style - more on those later. I went to work looking through Sue's stamps and supplies, to find items to work with the sketch and here's what I came up with, isn't she cute! 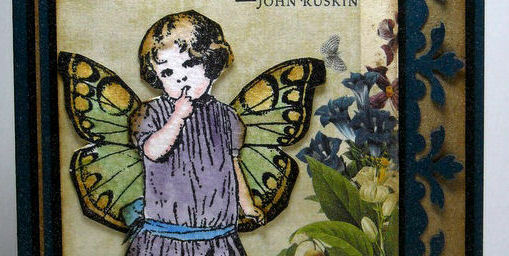 First I picked out my images - Butterfly from Hero Arts, sweet little Betsy from B-Line Designs (stamp in Black Archival on Watercolor paper), then found a scrap piece of Websters Pages. 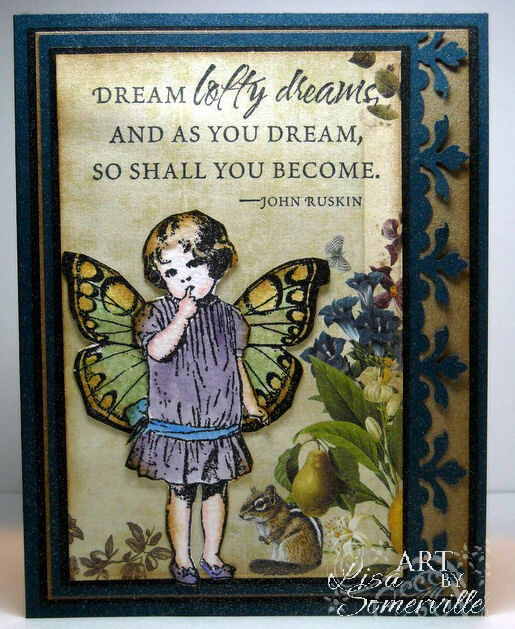 I cut out the images and colored using the Marker Watercoloring Technique, sponged the edges with Walnut Stain Distress Ink, cut the wings adhered them to Betsy, then to the pattern paper. The sentiment is from Impression Obsession. The finished project is spritzed with Ranger Perfect Pearls in Pearl. Love, love, love your image! This is beautiful. Love how this turned out! Great to see the two different approaches (yours and mine) to the same sketch. Beautiful! Thanks for spending the day! Those are some of my favorite colors and you have combined them into such a beautiful card. The little girl is so adorable. Love this! How sweet she is, glad you had fun! This is so cute. Betsy is one of my fave B Line stamps. I just love them all I suppose. What a sweet card! Love your amazing coloring! WOW! Gorgeous artwork Lisa! You made that challenge look easy! So bummed out to hear about your leaving PDCC. I hope that you will be happily challenged in whatever you choose! This is an adorable example! I love the frame color...I think it is peacock blue? I love the right border and she is just adorable! The wings are wonderful! I love the little squirrel! very cute image. Can't wait to see the cards you used out of your comfort zone! 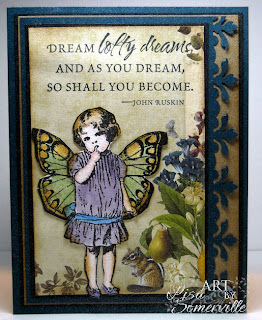 Beautiful creation, and such a wonderful sentiment, I totally think we have to have lofty dreams!